Visiting Duke Gardens last weekend I was struck by the complexity of foliage, but anyone who knows me would not be surprised that I was also enjoying the flowers. 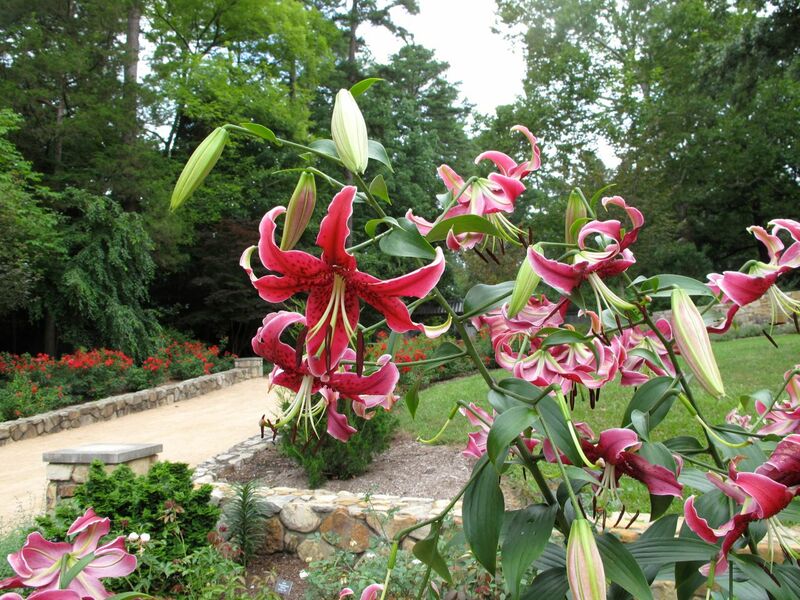 The rose garden was punctuated with beautiful Oriental Lilies. 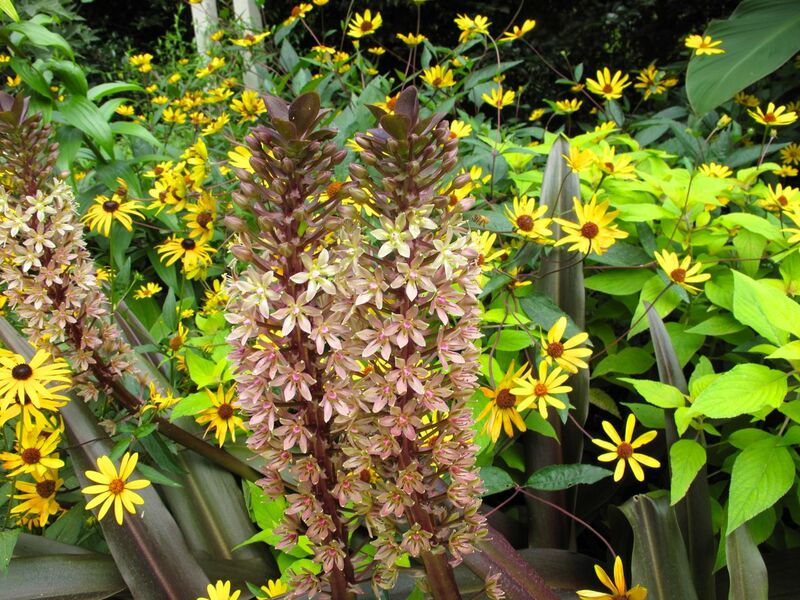 Next a cheerful group of summery yellow composites was enhanced by bring planted with Pineapple Lily at the beginning of the Perennial Allée. Once inside the Terrace Gardens the view was vivid, yet serene. The dark foliage and red blooms of the Canna nicely offset the cool, sedate greens vying with multicolored flowers. 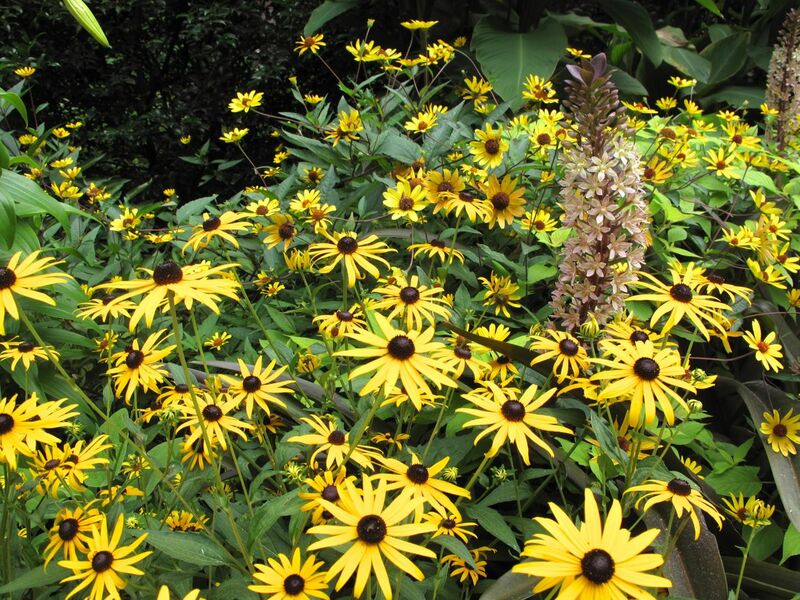 Taking the steps and rising above the canna I found the Rudbeckia hirta ‘Indian Summer’ to be quite winsome. Richly hued annuals accented the Terrace Gardens where each level is organized with thoughtful and exciting plant combinations. The Rudbeckia hirta ‘Cherokee Sunset’ were especially vibrant, so I studied what other materials were used in this area. Manihot esculenta ‘Variegata’ – Variegated tapioca was also listed on the plant marker for this grouping but I could not recognize it. 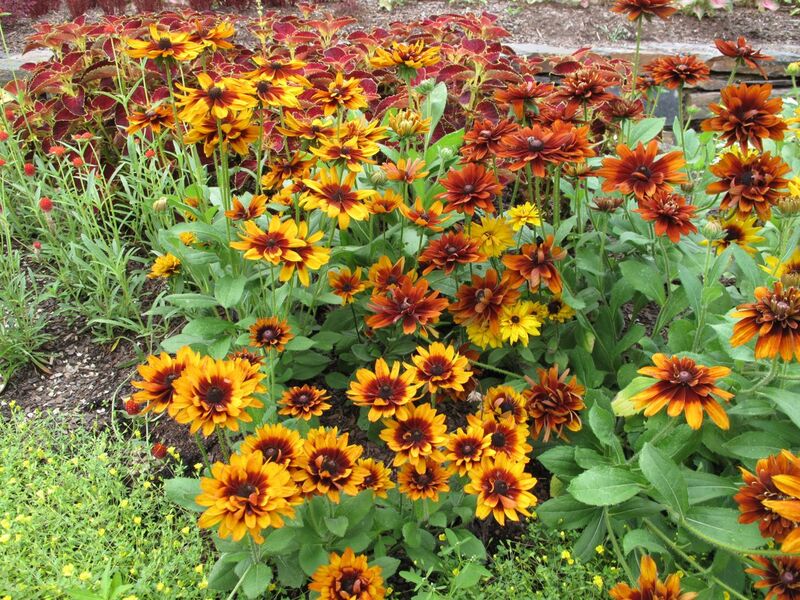 I like the effect achieved by mixing the Rudbeckia with the red Globe Amaranth and the dark wine coleus. The colors relate to the higher level as well. 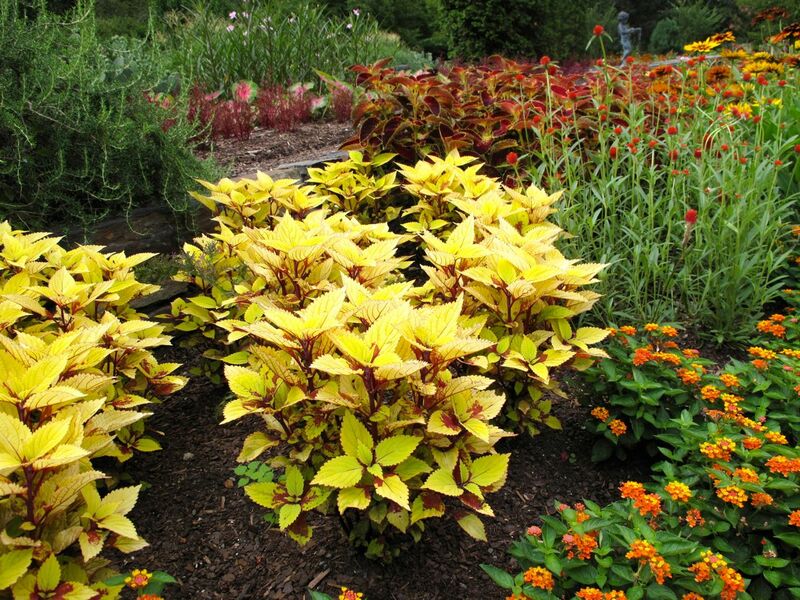 The bright citrus yellow of Pineapple Coleus is a strong and attractive choice in this collection. I do not plant many annuals but would enjoy this color in my garden. I have a much larger Lantana with similar coloring that could use a good companion. 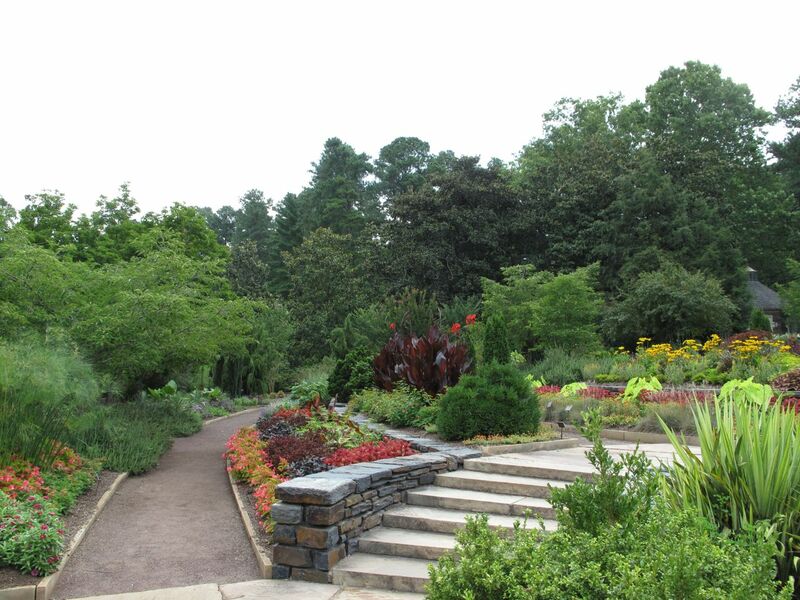 This entry was posted in garden and tagged photographing nature, Sarah P. Duke Gardens, summer garden on July 25, 2013 by pbmgarden. I have to admit that this isn’t my favourite kind of planting, however they have used some interesting combinations and some plants I don’t know at all. I especially like the small flowered red lantana? Christina, the lantana is the low-growing, orange plant in the lower right of the last picture. The small-flowered, red in the lower left of the previous two pictures is Gomphrena ‘Qis Red’ – Globe Amaranth. It dries very well. I think any of those coleus would set off a Lantana well. Like Christina, this planting is not really my “style”, but I do tend to look at individual plants rather than an overall effect, so I would love to walk around practically ANY garden, this one included! I like the “Baby jump up”, which I don’t think I’ve seen before. I just read that it loves heat, so may be worth looking for as an annual for the rockery next year. Thanks for sharing again Susie! 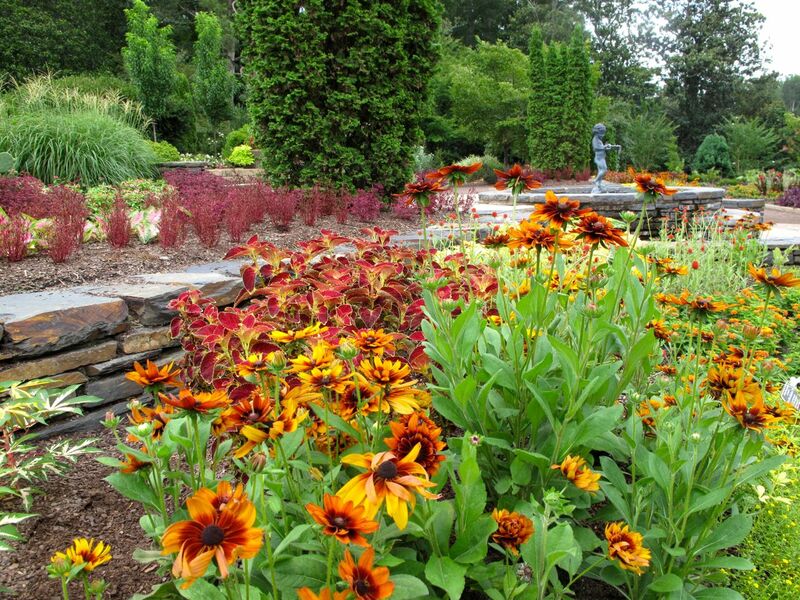 Cathy, I tend to zero in on individual plants too–that ‘Cherokee Sunset’ drew me in to look at this section. ‘Baby jump up’ would look great in your rockery. I’d never heard of it either. I love visiting different gardens and it’s nice this one is close enough to enjoy it at different seasons. Thanks for visiting! I do like this kind of planting! Theresstill a little more soil showing than I would like, but I love the lushness and the colors. Also even though I bet this was all bedded out in the spring it doesn’t have that municipal bedding plant feel. Probably because plants are blended in together well and there is so much height variation. 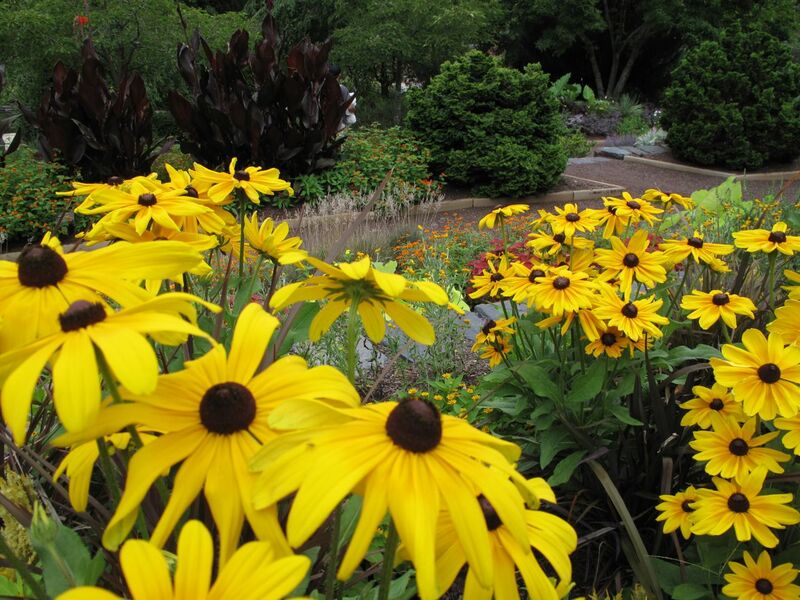 I like how they used the browns of the black eyed Susan. I’m never sure how to deal with that color… Sometimes I’m just anxious to rip it out and admit I can’t do it! I’m never sure how to use color either so it was an interesting exercise to explore this one specific planting combination. The spring planting was gorgeous with tulips and anemones. Very pretty. Please be safe in the gardens!! What a beautiful lily in your first photo, the perfume must have been wonderful. I do like the drift of Rudbeckia, such a cheerful colour! How lucky you are to have such a wonderful garden so close to you. Yes, I agree Pauline. The lilies were fabulous. They were growing in the rose garden but really stole the show. 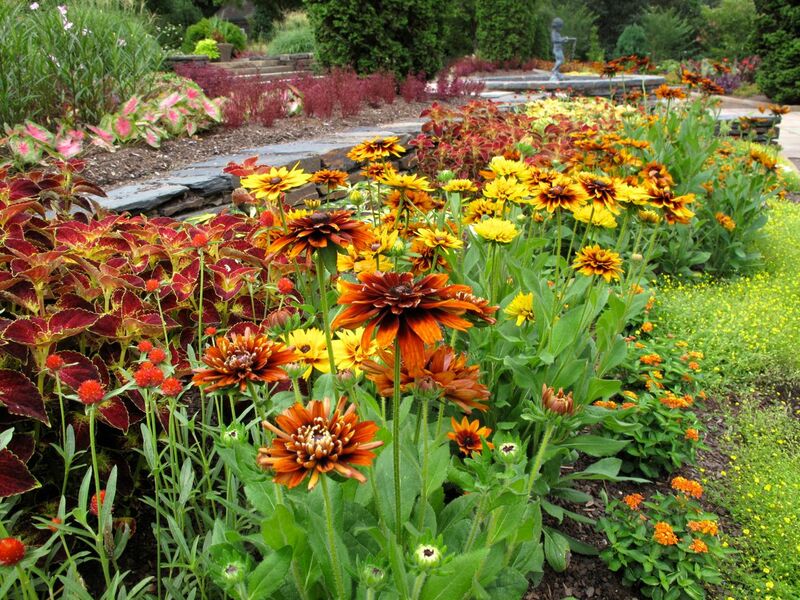 I love the mixed red and yellow Rudbeckia. Lovely garden! 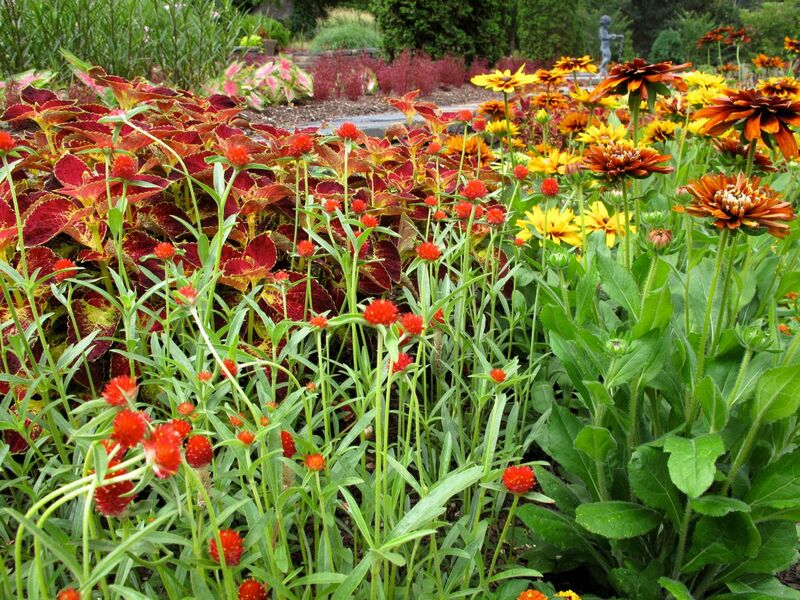 Beautiful flowers…especially that coleus and rudbeckia….oriental lilies blooming now…I love how they dance in the wind. Beautifull warm colour combinations. It is always good to see ordinary plants used so well – you don’t need fancy plants to make a good border after all! Yes, no need to overlook some of the old favorites.